Thanks to Quintessential’s full staff, there’s no need to lift a finger. Everything you could possibly want is in the resort, from wellness to dining to water sports. This villa is ideal for couples, because the bedrooms are all so private and spread out. Plus, the exterior is so gorgeous, you may never go inside! 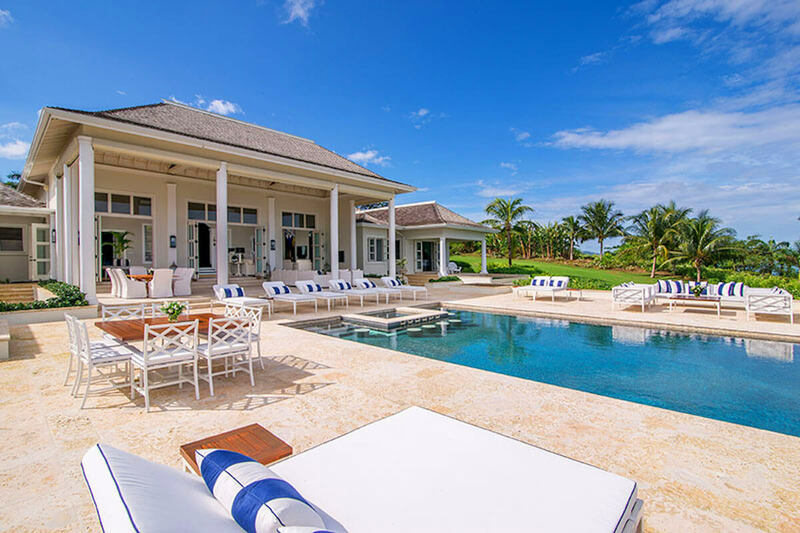 Quintessential villa is part of the Tryall Club on the northwestern coast of Jamaica. With a full staff and classical white gardens, this villa offers privacy and luxury. Quintessential is only a short golf cart ride from Tryall Beach, and comes equipped with three carts. At the villa, there’s a small putting green and a massive lap pool with a hot tub. An expansive terrace surrounds the pool, with tons of loungers, dining space, seating, and even a fire pit. The veranda shades an outdoor living area, dining table, and a plunge pool. There’s an indoor bar where guests can watch TV, play checkers, and drink. A lush, well-manicured lawn frames the property, with lush gardens to add a secluded, tropical ambience. The stately, white façade gives way to an elegant foyer, which has a small living room equipped with a flatscreen TV and ceiling fan. There are several places for guests to relax, inside and out. All five of the villa’s air-conditioned suites are private, have ensuite bathrooms, and enjoy ocean views. The Master Suite is the only bedroom in the main house, and has a king bed, TV, and exterior access. Its ensuite bathroom has a walk-in shower and a soaking tub. In an adjacent cottage, there are three suites that each have a full bathroom and a king bed. One has a TV. In the poolside suite, there are two twin beds that can be combined into a king. Quintessential is kept in perfect condition by a butler, assistant butler, housekeeper, laundress, chef, and two gardeners. The Tryall Club has nine tennis courts, a golf course, a private beach, water sports, restaurants, an organic garden, a kids’ club, a spa, and a fully-equipped gym. There’s no need to ever leave the resort, so guests can completely relax. Short golf cart drive to Tryall Beach.